PRODUCT: Miro Model 2.5-Conduit Support-2 Gang Conduit Pipe Support System, 12 in. Wide Unistrut with fixed 2-inch Height, 7-1/2 x 10 inch Polycarbonate Base. Price/Each. DESCRIPTION: A roof top pipe support system with a 12" wide Unistrut®. System is commonly used to support roof mounted electrical conduit, solar piping, gas pipes, and other mechanical piping. The unique design absorbs thermal expansion and contraction of pipes thus preventing damage to the roof membrane or piping system. Pipes rest on the 14 gauge P4100 Unistrut system which is made of hot-dip galvanized steel. 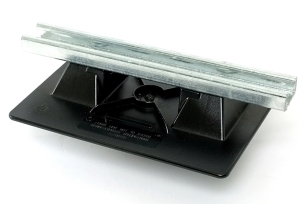 The pipe support base is made of polycarbonate resin. The other metal parts are made of hot-dip galvanized or stainless steel. Pipe stand will accommodate up to 2.5" pipe (inside diameter) or up to 3" (outside diameter) pipes. Base Material: Polycarbonate 7-1/2" by 10"
Hardware: Stainless or hot dip galvanized. Max Pipe Clearance: 2.5 Conduit Support has a maximum pipe clearance of 2.5". Miro 7-1/2 inch Wide x 10-5/8 inch Long Rubber Support Pad. Provides a protective barrier between roof membrane and rooftop equipment for 7/10 bases. Features 100% recycled rubber and raised lip for slip resistance. Price/Each.